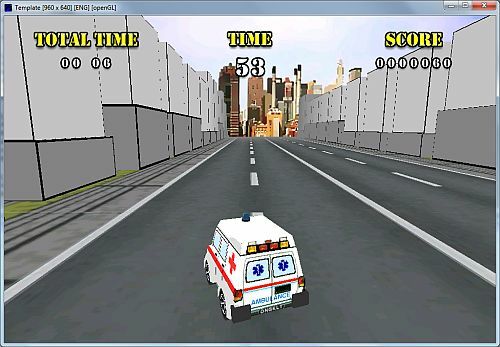 Ok, yesterday night (few hours ago…) I’ve done another step forward for Ambulance Duty TURBO (for #charitygamejam). Getting rid of the sample road model, I made the environment “dynamic” (based on 2D, multilayer, array/map – that I fill with elements), and I created (with my quick&dirty 3d companion, Wings3D) some basic palaces models (I didn’t care for texturing at the moment, but they won’t look gray boxes at the end). I put a skyline at the horizon (a jpeg image I found – and color modified – free, on TurboSquid – I’ll give credits in credits section once I’m sure I can use that), and I tried to have a camera (and a hud) similar to Outrun. Ambulance (at the moment) drives faster and faster, and you can steer right or left clicking on the right/left area of the screen. I won’t allow you to go too outside the main road (I’ll slow you down once your ambulance start to leave it) and next step is to put other vehicles on the road against which you could collide. Anyway, I think I’ve decided to “connect” this little game to Medecins Sans Frontieres (I charity I give some money myself, from time to time) – and so Donate button I guess with link here. More work tonight – when we’re leaving the “minus three days at the end” area. A note: of course I’ll finish (and publish, free, with Donate button) Ambulance Duty TURBO anyway, even if I won’t be able to put everything together before the deadline.